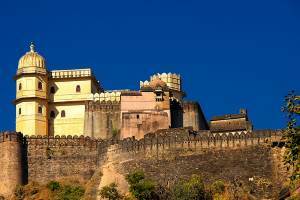 This is one of the most outstanding forts of Rajasthan. This is the fort where many pages of history book can be recollected. 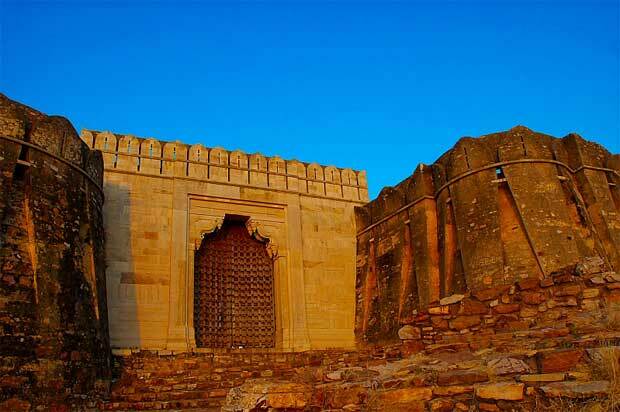 Located at the top of 180 meter high hillock covering massive area of 700 acres this fort is still houses around 2000 persons inside its complex. At one end of the Chittorgarh town the road climbs up and passes through several gates each one with a heroic story associated with it. Finally at the top of the hill the ticket counter is there to collect the entry tickets. Inside this open fort ticket is checked only at two places one is while climbing Vijaya Stambh and other one is at Rani Padmini palace. As the area of the fort is vast It is bit difficult to walk around so it is preferred to use a local vehicle to visit the fort. 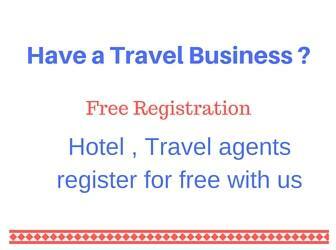 You can directly book one Auto or Cab from railway station or bus stop itself. While climbing through curved roads to the fort the first main gate is Badal Pol, then Bharon Pol, then Hanuman Pol, Ram pol with distinct Rajput architectural style. 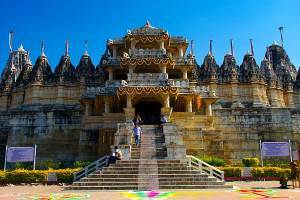 There are several watch towers and Chhatri constructed near the gates. 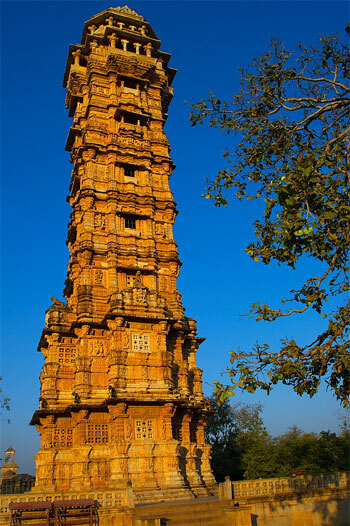 Vijaya Stambh or Victory tower. 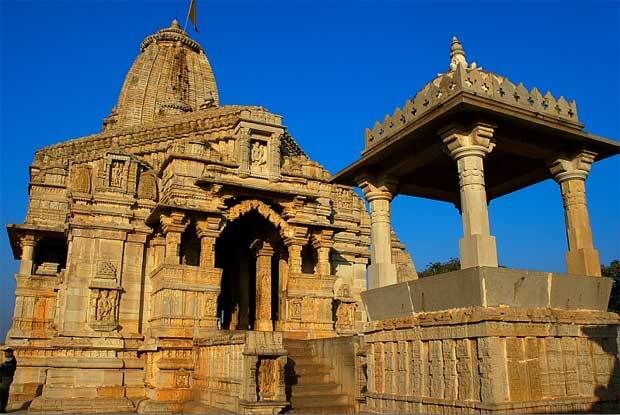 One of the most interesting monument of Chittorgarh fort this was constructed by Rana Kumbha in 1440 to commemorate his victory over the combined forces for Kings of Malwa and Gujarat. This nine storied 120 ft ( 36.5 meter ) high structure has a girth of 30 ft at the base. There are around 100 to 110 steps are there inside. While climbing take care of your head as the steps are oriented in a circular narrow path. Sometime steps are located at the center and in some floors they are at inner circumference. It is like Kids dark tunnel system in amusement parks. Each floor has windows or Jharokas in all four directions to take view of the fort. This palace will be at you right while entering from Main entrance or Badipol and Tripolia. 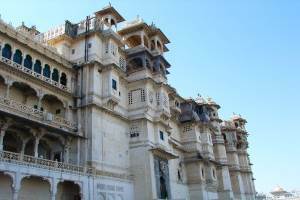 Many addition and alteration was done by Maharana Kumbha ( AD 1433 � 68 ) to this palace. There is a long corridor in which one side is living palace of Queens and other was for Ranas or Kings. There are doorways to Surya Gokhra, Zanana Mahal, Kanwar Pade Ka Mahal and other residential structures. 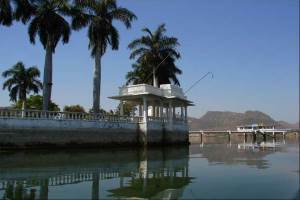 The next main attraction is Rani Padmini palace, there is a extended part of the palace within a pond which was used by Rani Padmini during summer time, locally it is known as Jal Mahal. 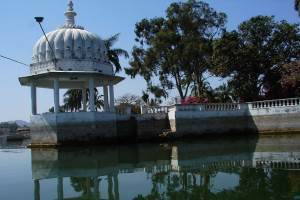 Queen was using boats to reach this summer house inside water. The main palace was used by Rana Ratan Singh to show glimpse of his wife legendary beauty of Rani Padmini to Ala-ud-Din Khalji by using a mirror. After this Ala-ud-Din-Khalji attacked Chittorgarh to possess her. 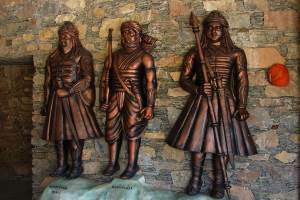 Temple of Mirabai is another attraction of this fort. The main sanctum design resembles Puri Jagannath temple. Beautiful Stone carvings can be seen on temple walls around the complex. Entry fee is Rs 5/-, Guide charges varies from Rs 100/- onwards. There is a local art and craft showroom at the entrance of the fort. It will take two hours to complete the visit of the fort. The famous song of classic movie Guide (starring Dev Anand, Waheeda Rehman ) shooting done at This Chiturgarh fort. Watch the song in U tube, you will see Padmini Palace , victory tower and many other monuments of this fort.